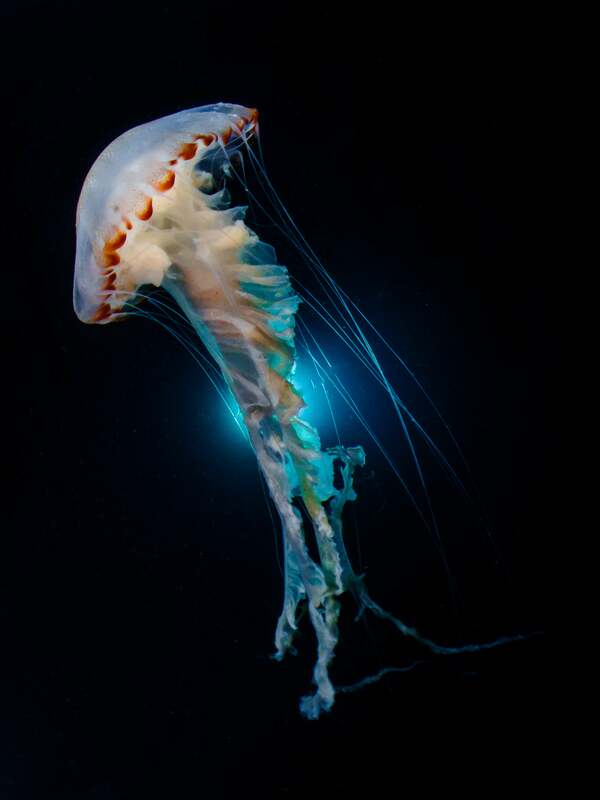 In the sapphire-to-stygian waters that cover 70 per cent of Earth’s surface, fish school in iridescent sheets, whales sing mournful tunes, and jellyfish bloom like wildflowers. The ocean is a teeming mystery that most of us rarely dip our toes in. Thankfully, underwater photographers are working to bring portraits of its inhabitants back to shore. And in 2018, those photographers delivered in a big way. The results of this year’s Ocean Art Underwater Photo Competition, a 7-year-running contest organised by the Underwater Photography Guide, have just been announced and the winning photos—culled from thousands of submissions across 70 countries—might just convince you it’s time to start exploring the deep. This year’s competition awarded over $80,000 (£62,000) worth of prizes in 16 categories, including marine life behaviour, cold water, and an entire section devoted to brightly-coloured sea slugs called nudibranchs. The competition also included categories for various methods of underwater photography, like mirrorless and DSLR. While underwater photography may sound like a niche activity exclusive to those with private company submersibles and expensive cameras, Scott Gietler, Underwater Photography Guide publisher who served as one of the competition’s four judges, said that more and more amateurs are taking it up, thanks in part to the advent of better and cheaper smartphone cameras. “You [now] have a much higher percentage of people that are just amateurs, citizen scientists, dentists who go diving three times a year who can shoot at a professional level,” said Gietler. That’s a good thing when it comes to saving the oceans. Gietler said that many folks who become involved in underwater photography are inspired to take on various conservation causes. 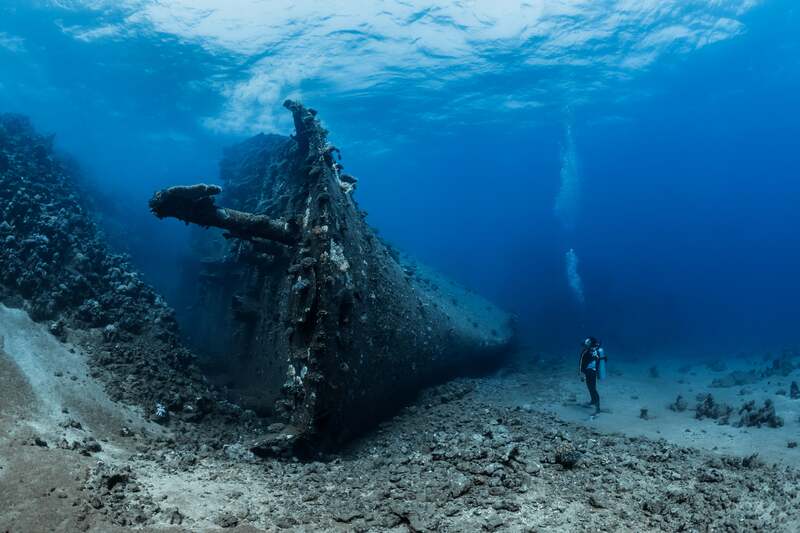 Locales that become popular with divers and photographers, including spots in the Indonesia, the Philippines, Mexico, and the Galapagos, have more incentive to preserve their underwater heritage rather than allow it to be spoiled by industry. 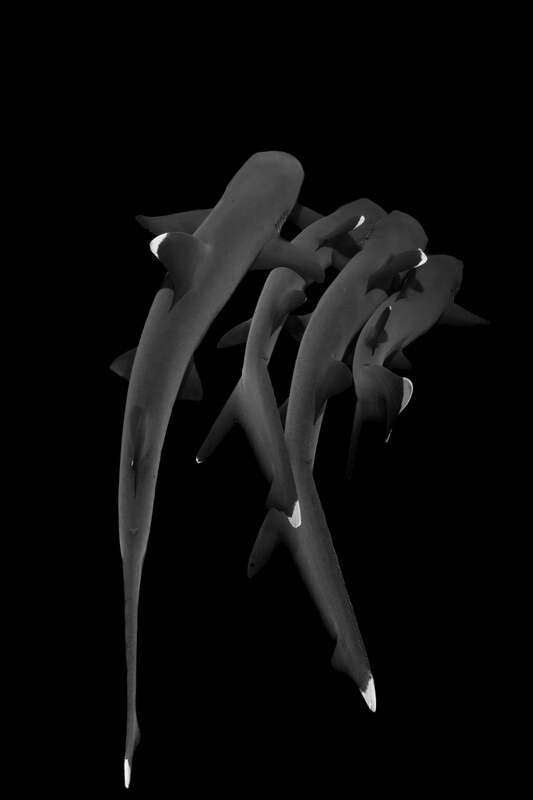 And, of course, the photos these divers capture disseminate the ocean’s wonders to the wider world of land lubbers. We’ve collected some of our favourite award-winning images from this year’s competition below, but you can check out all the top photos and the stories behind them here. This bad boy won Best of Show and it’s easy to see why. 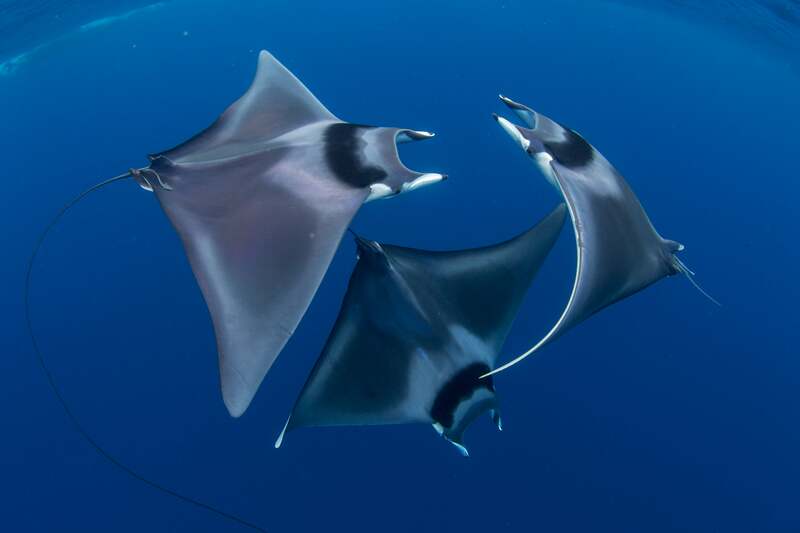 How many of us will ever witness a pair of rays engaged in courtship, much less three? Duncan Murrell was on scene to capture the fleeting encounter in which two male Spinetail devil rays attempted to court a female in Palawan, the Philippines. No word on who won the lady’s favour. 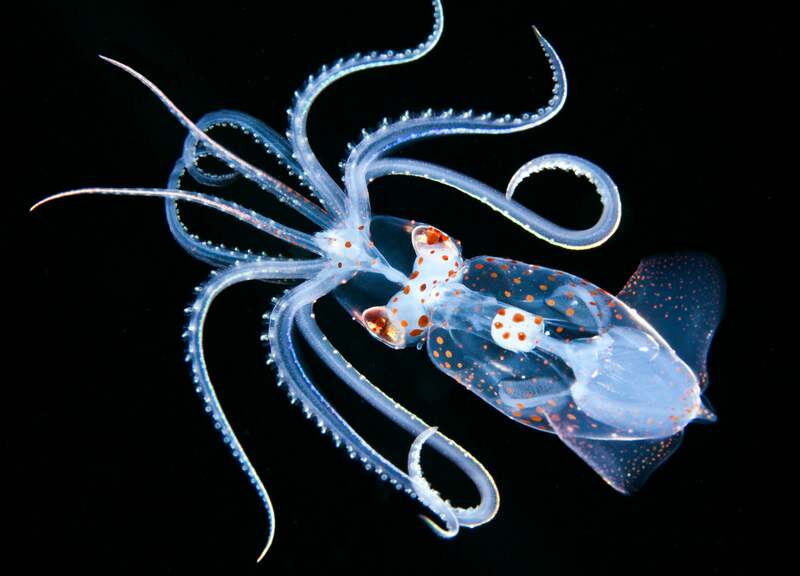 Jeff Milisen spotted this sharp-eared enope squid (Ancistricheirus lesseurii), during a nighttime dive off Kailua-Kona, Hawaii. He chased the teeny kraken nearly 100 feet down into the abyss and captured this exquisitely detailed close-up, which won first place in Macro. In the age of humans, wildlife are increasingly finding ways to give our trash a second life. 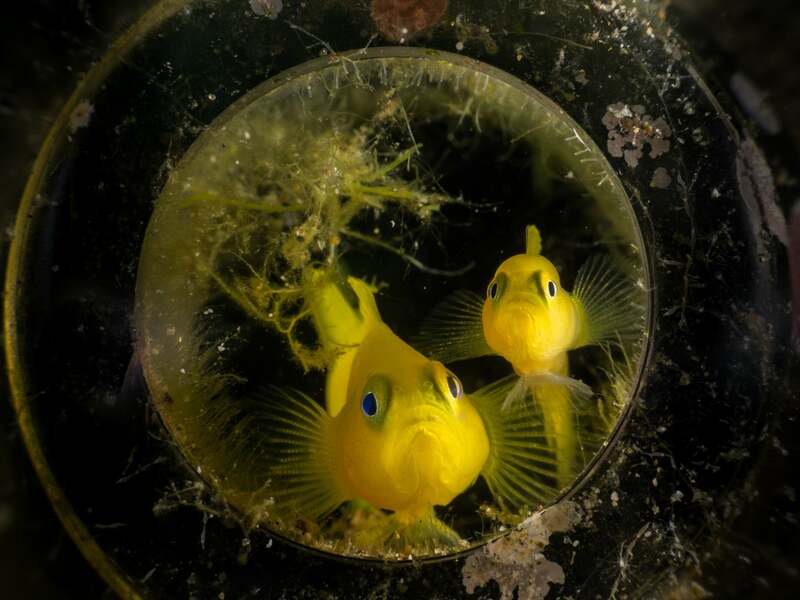 Matteo Pighi shot these yellow pygmy gobies, which took up residence in a derelict beer bottle in Anilao, Philippines, and won third place in Compact Macro. There’s something strangely soothing about this portrait of white tip reef sharks chilling at the edge of an underwater cliff off Mexico’s Revillagigedo Archipelago. Although I’m not sure I’d feel that way if I were the one shooting them. 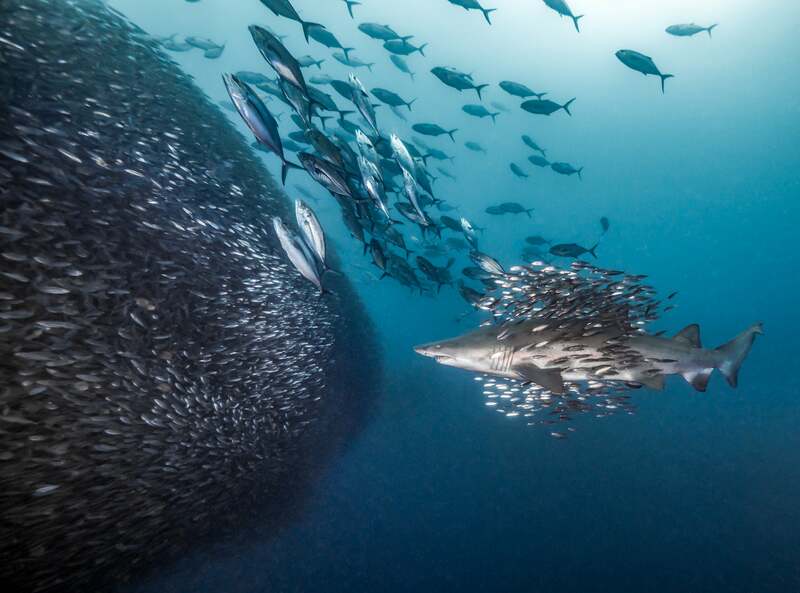 Photographer Jin Woo Lee explains that while he was as he was approaching the animals, a “strong vertical current” pushed his body down, “which made all the sharks freak out”. Thankfully, he emerged no worse for wear. His shot took third place in Compact Behaviour. Shoutout to the dads. 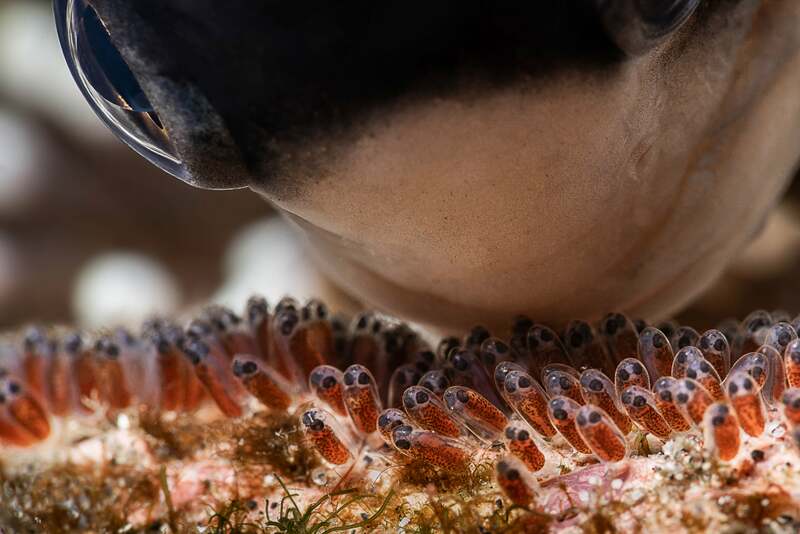 Third place in Marine Life Behaviour went to François Baelen for this incredible close up of a male clownfish in Padangbai, Bali tending to dozens of baby Nemos. A female sand tiger shark sizes up some potential lunch options—or perhaps she’s just as mesmerised by the giant bait ball as we are? Debbie Wallace’s photo of this rare scene off of Morehead City in the US state of North Carolina won second place in Mirrorless Behaviour. Nudibranchs never fail to put a smile on my face, but even by sea slug standards, this festive little guy stands out. 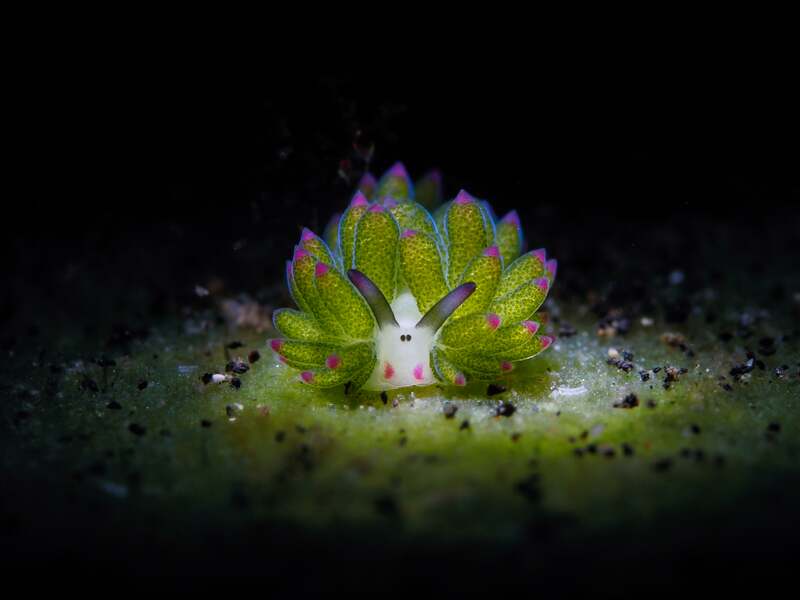 It was shot by Chun Ho Tam Lembeh Strait, Indonesia and received an honourable mention in the Nudibranch category. Do yourself a favour and check the rest out, too. 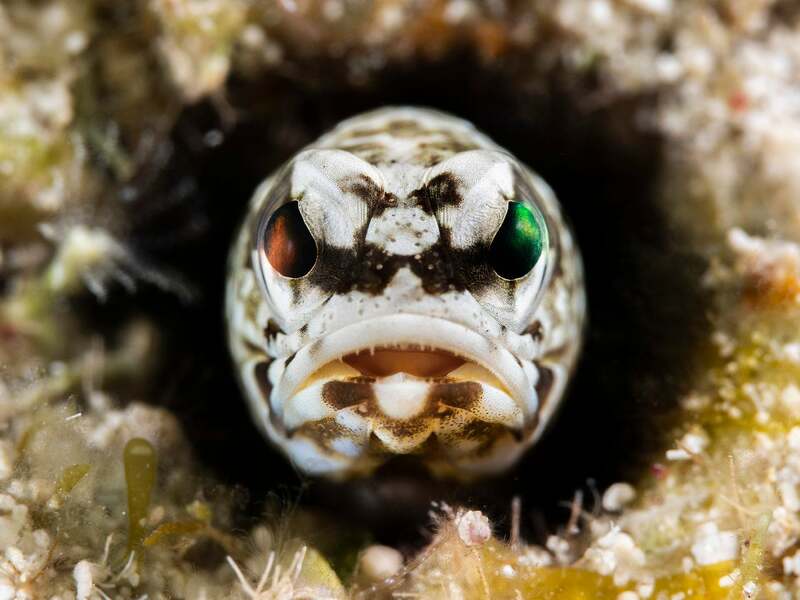 Here you see a chaenopsid blenny “cleaning up its lair” in Kanagawaken, Japan. This also happens to be my exact face when I realise my flat’s a mess. 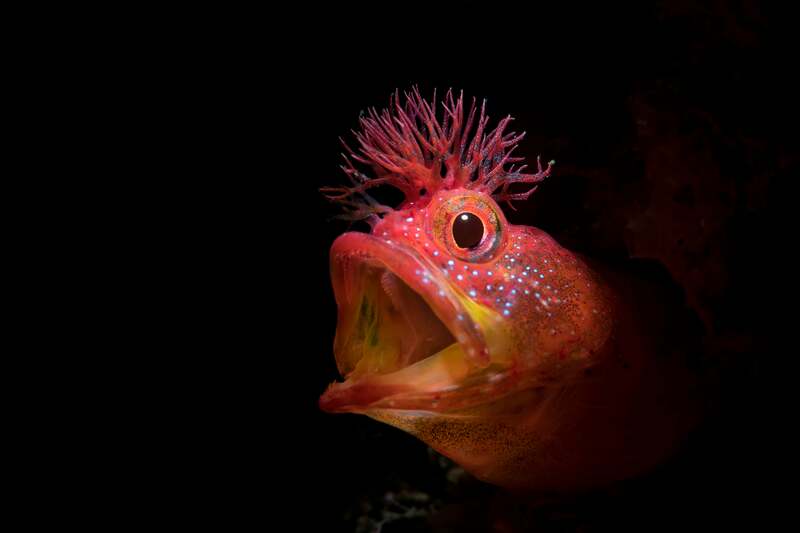 Jinggong Zhang’s relatable shot of the most punk rock fish in the ocean received an honourable mention in the Portrait category. 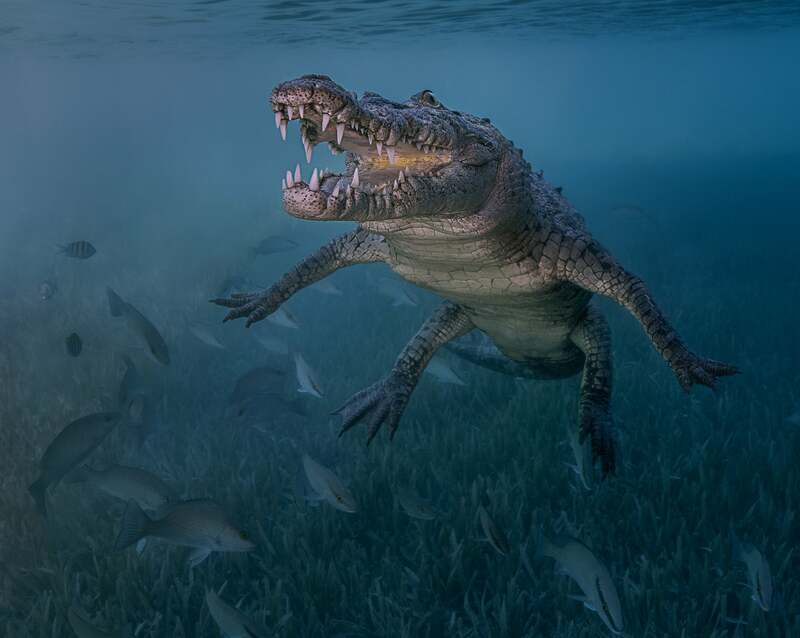 Antonio Pastrana won second place in novice DSLR for this haunting shot of a crocodile named El Niño in Jucaro, Cuba. Rafi Amar apparently waited over an hour near Shark Paradise, Bahamas, to snap this shy guy that looks like an RPG villain. His patience was rewarded with an honourable mention in Mirrorless Macro. Melody Chuang chased this jellyfish along the northeast coast of Taiwan for over a mile at night. Her husband used a diving torch to create the backlight for the ethereal shot, which won first place in Compact Wide Angle. Some travel to Iceland in the winter to witness the famous aurora borealis. Others prefer to dive into frozen lakes and watch as ephemeral Arctic sunlight percolates through the ice. 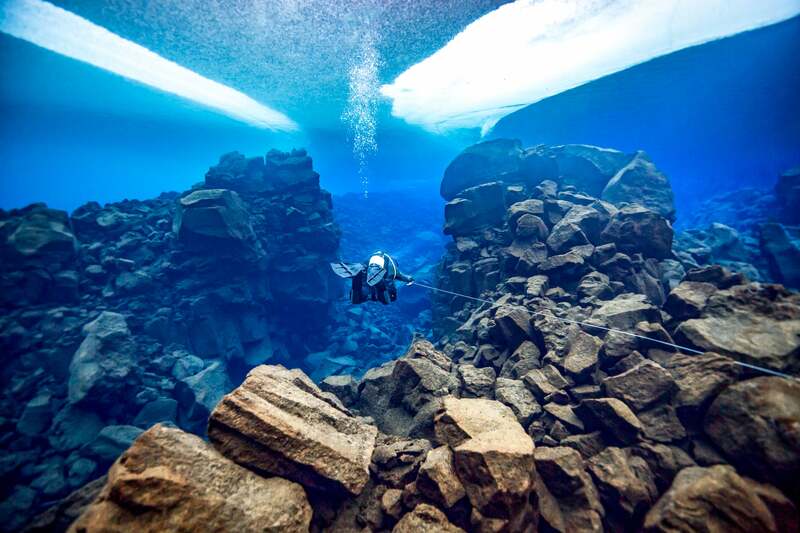 Adam Martin’s idea of an Icelandic vacation isn’t for the faint of heart, but it did win him an honourable mention in the Cold Water category.